Louder Than War asked long-time Go-Betweens fan Dan O’Farrell to review this for us…. Of all the bands described as indie in the 1980s, The Go-Betweens seem to divide opinion amongst music fans more than many more angry or abrasive outfits. Those that adore them (and I am assuredly one of those) constantly encounter blank-looks from those who never succumbed to their charms, so much so that the delicate fan (and aren’t we all?) starts to wonder whether we just dreamt their strangely angular and esoteric Australian pop nous. This despite them appearing on nearly every indie and faux-indie record label of the decade: The Abel Label, Postcard, Rough Trade, Sire, Beggar’s Banquet… This litany of labels tells its own story: no-one backed them for long, but they were just too damn good to be forgotten. 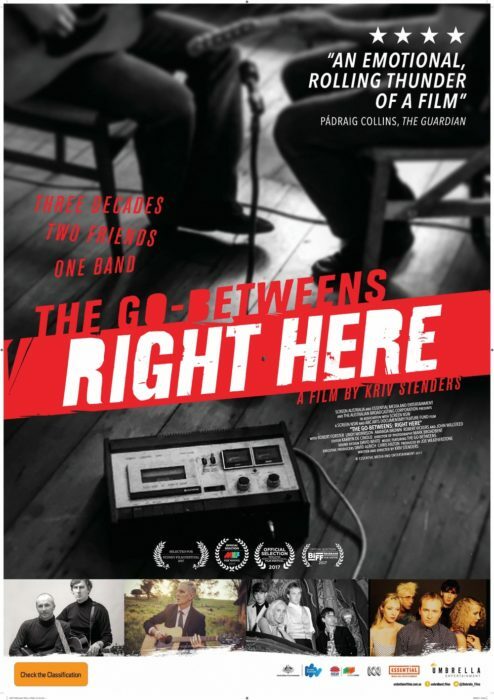 The Go-Betweens: Right Here – Trailer from Gary Phillips on Vimeo. typically graceful and donnish form, then had to watch his best friend ‘come up behind him in the rear-view mirror’ in terms of song-writing until, with the beautiful ‘Cattle & Cane’, ‘he was gone from the mirror. He was ahead of me’. Watching this film, you see Forster sink further and further back in the video-shoots and promo spots for the band’s singles as McLennan’s songs became poppier and more commercial. You see a man almost become written out of his own band. There are some telling silences in this movie as Forster, filmed in an outback villa where all surviving band-members sit to talk about their experiences, deals with his feelings about McLennan. What comes across is love, respect, frustration and an openly admitted competitive streak. Forster wrote better songs to compete with McLennan. Their friendship defines the core of the story. 2) The gender politics: Indie music in the 80s could seem a real ‘boys’ club’ at times. The Go-Betweens, however, were blessed with the fantastic Lindy Morrison on drums and, later, Amanda Brown on violin and oboe. The female voices in this film are crucial, with Morrison, in particular, cutting through any amount of precious male angst. She and Forster were an item for the early years, but she dumped him ‘at the worst possible moment’. To live up even further to the ‘indie-Fleetwood Mac’ feel, Brown became McLennan’s girlfriend soon after joining the band – at Morrison’s instigation – before the recording of ‘Tallulah’. The moment when the two male songwriters – skint, back in Australia and licking their wounds after the failure of their finest pop album – ’16 Lovers Lane’ – to shift any copies, decide to sack Morrison and Brown and go it alone – with McLennan not realising that Brown would immediately leave him for this ‘betrayal’ – seems genuinely dramatic and heart-breaking all round. Morrison and Brown are interviewed together at the end of the film and both are still enraged at being disregarded so suddenly. It makes for compelling and uncomfortable viewing. 3) The film-making. There is something sad and elegiac about The Go-Betweens’ story. They often seemed a heroic band of misfits battling constant bad-luck and belittlement. Even one of their best friends, Clinton Walker, a hilarious talking-head here , described their first major-label album as ‘an absolute turkey, mate’ to their faces. But sheer self-belief saw them carry on. The reformation in the early 2000s hinted at greater rewards to come – ‘Oceans Apart’ sold more than any of its predecessors – but McLennan died suddenly in 2006 just when things might have been about to finally course-correct. Director Kriv Stenders captures this beautifully in his stately pacing of this documentary, letting the protagonists reveal the joy and darkness of their story without over-dramatising or rushing ahead. I would recommend this film to any music-lover, Go-Betweens’ fan or not. They were true underdogs, and the human cost of their quest to keep making music cannot undermine the purity and enduring freshness of their finest songs. All words by guest reviewer Dan O’Farrell. Dan O ‘Farrell was frontman with Accrington Stanley and now the Difference Engine. The bands second album was released on 9th November 2018 and is reviewed here.